A finely crafted stone wall frames in the flagstone patio. Light niches have been installed just beneath the stone coping. 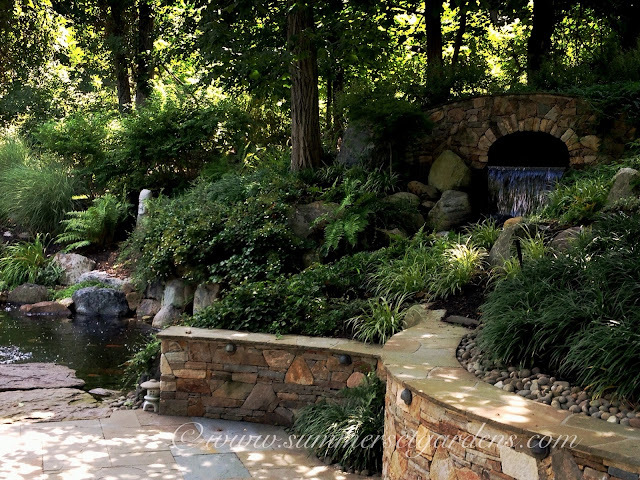 An opening in the wall leads the large stone slabs that create a "floating" stepping stone path across the Koi pond. To the upper right you can see the beginning of the waterfalls that spill out of a stone tunnel I created. The perimeter is lushly planted with Ferns, Hosta & Perennials. This landscape architecture & construction project is located in Southern NY.